The optimism that Kumar Sangakkara’s side will repeat the World Cup winning performance of Arjuna Ranatunga’s 1996 heroes is quite high among cricket fans, but one thing that’s standing in the current squad’s way is the country’s inefficient and corrupt cricket administration. Ranatunga and the crowd were presented with a smooth platform to perform 15 years ago, as cricket administration was in the safe hands those days with Ana Punchihewa as the head of Board of Control for Cricket in Sri Lanka. 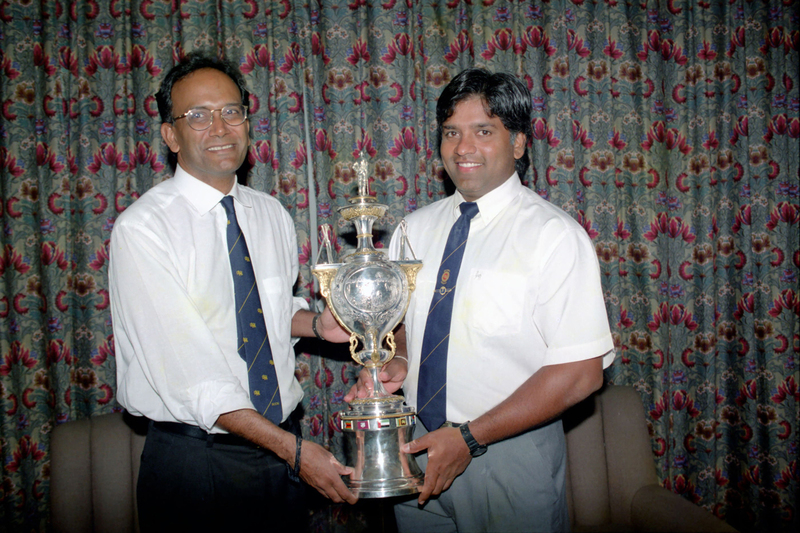 Punchihewa took to cricket administration in the year 1994 as a Vice-President to the late Gamini Dissanayake. 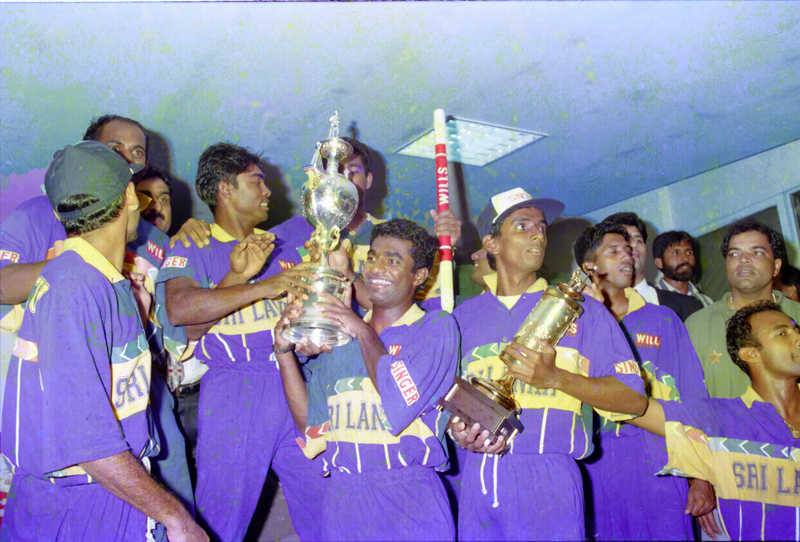 Following Dissanayake’s assassination, he headed the board and launched his forceful plan, ‘To be the best cricketing nation by 2000’. His plan was not only to make Sri Lanka the best cricket playing nation in five years time, but to improve infrastructure, umpiring, coaching, domestic cricket, take the game to grass root levels and a whole lot more. 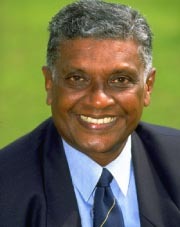 When he took over the cricket administration, Punchihewa was head of Coke in Sri Lanka and he brought in his corporate skills to the Board of Control. One of his first moves was to appoint Duleep Mendis to the dual role of Chairman of Selectors and Manager of the national team. He was extremely conscious to set up a vibrant team management and was searching for a qualified coach as well. He steals the spot light with his toe crushers, bouncers and wicket taking ability and also his ‘Lion like’ hair style, breath taking tattoos and piercings. 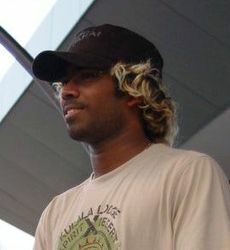 He is Lasith ‘slinger’ Malinga who is one of Lanka’s best match winners and this author met up with him and had a chat about his much spoken test retirement, about the World Cup and the Melbourne miracle. Here are some excerpts from the interview. 1. Why have you dropped about 10km/h in speed? I hardly see you bowl at 145 anymore? Is it because of your injury. Did you cut down the speed because of injury, or is it because you are concerned on bowling economically? I have always been an attacking bowler and I try to take wickets. I would rather bowl wicket taking deliveries that will even go for runs than be containing. I have reduced my speed due to the injury that I suffered. Read the rest of this entry ? Talking of cricketing families, the Wettimuny family has a unique place in Sri Lankan cricket history. All three brothers, Sunil, Mithra and Sidat went onto represent Sri Lanka. Mithra and Sidat opened batting in two Test matches, while Sidat became the first Sri Lankan to score a Test hundred (157 in Faisalabad in 1982). His 190 at Lord’s is still considered one of the best knocks by a Sri Lankan overseas. 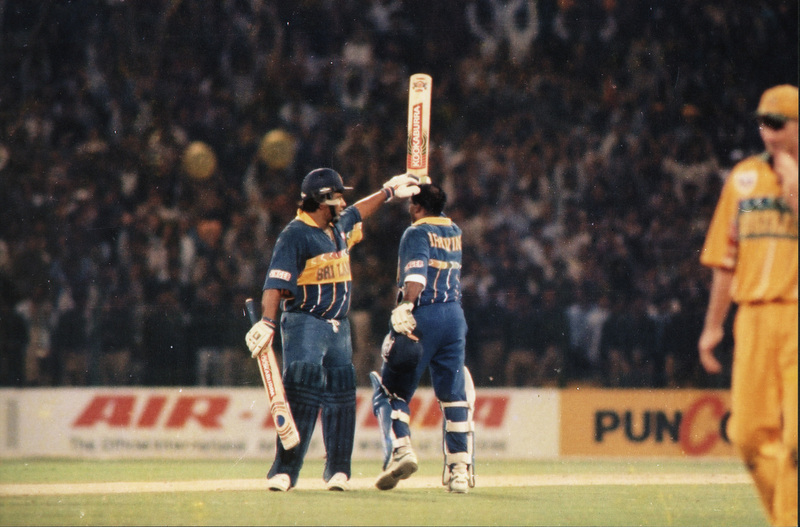 The other two brothers also had their moments and very few know that the first ever World Cup half-century for Sri Lanka was scored by Sunil. That half-century in the 1975 World Cup was against Australia when Jeff Thomson and Dennis Lillee were at their peak and it was a game that saw him ending up in hospital after being hit by Thomson. 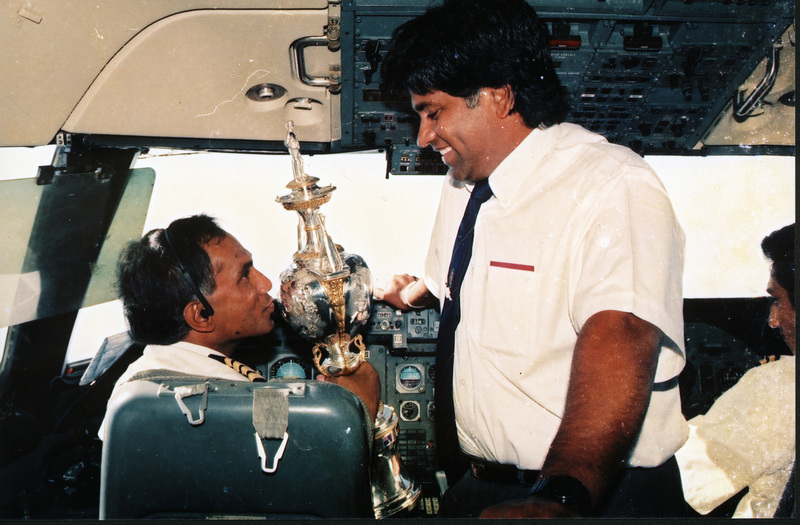 Wettimuny persued his career in the aviation industry as a pilot after prematurely ending his cricket and he had his moment against the Aussies when he was the captain of the flight that took the victorious Sri Lankan team home from Lahore. In today’s ‘Memorable World Cup Moments’ captain Wettimuny, who was once destined to lead Sri Lanka, recalls bringing the team home from Lahore. “I was extremely tired as the captain. I had done the flight to Lahore with eight ministers on board. Then I watched the game straight away after the flight. Then I wanted to sleep because I had to take the flight back, but Sidat and Duleep (Mendis) were knocking on the door asking whether they could take the team back home with me,” Sunil Wettimuny, who was flying for Air Lanka at that time, said. To bring about racial unity and understanding through sports among children of the three main communities is the aim of setting up the new sports school in Nattandiya.Eighty children from the Sinhalese, Tamil and Muslim communities will be admitted to the school who will take part in swimming, football, cricket, basketball, badminton, volleyball and table tennis. Coaches from Sri Lanka and abroad will train the children in these sports. They will also be taught arts and culture. By interacting with each other the children will also learn to live in harmony with other communities. A new sports stadium too will be built adjacent to the school which is being set up on a concept by Dr Nico Schulenkorf of Auckland University of New Zealand on developing capabilities, fostering friendship and understanding between communities through sports. Man is a pack animal. Man lives and survives in groups. Man does not survive in isolation. Killer Whales are also animals like that. Moreover, they are found in every ocean on the earth. They are adaptable to all situations and climates. They have a strength and grace unique to them even as they hunt down their prey fearlessly. They work as a team even though swimming is an isolated activity. That is how I want my swimmers to be,” says Manoj Abeysinghe, founder of the ‘Killer Whale’ Swimming Club. Like the killer whale swimmers are the most intelligent sportsmen. They learn to manage a clock in the pool, they learn to manage time in the lives. Within a year, he has worked wonders with his own sons and with at least a hundred swimmers in Sri Lanka. His students worship him as they leave. “He is so committed to us and he is always behind us no matter what happens,” says Reshika Udugampola- National Womens Champion. “He guides us but never forces us,” says Sampath from the Air Force. “He is truly one of a kind. His training methods are enjoyable and his commitment is one hundred percent,” says the captain of the Club – Air Force Captain Priyadarshana Sampatha – Open Age Group Champion. “All my hundred odd swimmers may not get gold medals at International meets but that does not mean that we don’t try. If we try and don’t get it, there is no shame in that. If we don’t try then there is shame in that,” says Manoj Abeysinghe who is buiding a pool in partnership with CR and FC and will take on at least a thousand swimmers before next year from beginner to International level. Sri Lanka’s swimmers are surely going to make a mark in the world very soon with the dedication, commitment and ever evolving techniques of Manoj Abeysinge. Sri Lanka‘s swimmers are surely going to make a mark in the world very soon with the dedication, commitment and ever evolving techniques of Manoj Abeysinge. In the balmy 60’s and the 70’s, sure there were heaps of flamboyant ‘gloves’ being flashed around, but flash and flamboyance by itself would not have done. That would have been the selectors’ line of thinking. We needed steadfast dependability behind the stumps. Besides which someone had to comprehensively ‘dent’ the new ball for us. Take it ‘head on’ if you like. Mckenzie, Hawke, Lillee, Thomson, Brown, Snow, Willis, Hall, Safraz, Masood, Holder, Roberts, Holding, Marshall and Clarke and a young tearaway Imran Khan, were dynamiting the worlds ‘top order’ batsmen — to thy kingdom come. Cometh the hour, cometh ‘our’ wicket keeper – opening batsmen. That’s Edward Ranjit Fernando for you. In the fast lane then. No fancy crash helmets nor dandy arm guards. Dunked at the deep end in 1969, aged about 24, Ranjit with a 58 and Buddy Reid with 57 chased Cowdrey’s Englishmen all over Wanathamulla, to eventually surpass the visitors 236 in 60 overs, for a priceless ‘One Day’ victory. The ‘two good pals’ Buddy and Ranjit soon followed it up with a pulsating opening stand of 118, in the ‘follow up’ three day International, a mere 72 hours later, with Buddy Reid grafting a 59 and Ranjit, battering a typical 45. In our baptismal World Cup outing of 1975, Fernando was adjudged this Country’s Best Batsmen, with a brilliant 98 not-out against New Zealand, in one of the ‘side’ games – as his best. That particular morning his bat was ‘All Middle and No Edges’. Then again in 1979, with Lanka sliding to defeat, Ranjit and Roy Dias came together to stave off embarrassment, with 49 and 44 respectively – against Marshall, Clarke and friends. Not very friendly pace though. Read the rest of this entry ? As the countdown to one of the world’s largest sporting events begin, Sri Lanka Cricket (SLC) embarked on a journey to ignite the spirit of the game in the hearts of every Sri Lankan, through the launch of its Official Multimedia Communications Campaign. The nation wide initiative is expected to gather support for the National Cricket Team in the run up to the Cricket World Cup 2011. SLC aims to enhance the moral of our nation’s cricketing heroes participating in the Cricket World Cup 2011, in the hope of bringing back the 1996 Cricket World Cup glory to Sri Lanka. SLC ceremoniously launched the “Official National Cheer”, a song titled ‘Enna’ by the award winning popular Sri Lankan pop artist Lahiru Perera, written by Manuranga Wijesekera, and produced by Sri Lanka Telecom Mobitel. Lahiru, the music powerhouse who redefined baila through his unique music strides, won an award at a recently concluded music ceremony for ‘Most Popular Music Video’. Read the rest of this entry ? Sri Lankan scientist and ergonomist Dr. Ravi Goonetilleke now based in Hong Kong has offered his services to resolve the Muralitharan dilemma once and for all. Constant dithering by the ICC and Australian authorities has made this fiasco into a recurring nightmare for a young player hailed as a world class spinner of the ball. 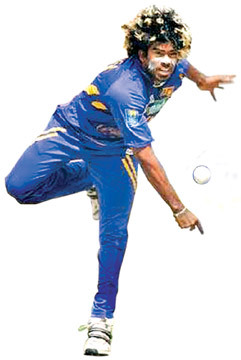 The chucking controversy has degenerated into a circus act with West Indies captain Richardson and all-rounder Carl Hooper who were facing Muralitharan during a three-over spell when he was no balled seven times by umpire Emerson, being mystified at the decision. Dr. Goonetilleke is a Professor of Ergonomics at the Department of Industrial Engineering and Engineering Management in the Hong Kong University of Science and Technology in Clear Water Bay. Dr. Goonetilleke has set up a world class Human Performance Laboratory to enhance the science of Ergonomics during his 16 month stay in Hong Kong. He has been practising in this specialised field for over 14 years in the United States and Hong Kong. Prior to his present position in Hong Kong, he headed the Ergonomics Research Division at the NIKE Sports Research Laboratory at their Headquarters in Oregon USA. He has been constantly involved in various research activities and projects with world class athletes and sportsmen and women while working at the world class fitness company, NIKE, Inc. Ergonomics is the scie nce that deals with the interactions between humans and the tools and equipment they use. In simpler terms, it deals with various human-machine interactions. One primary component of this science is the measurement of posture during work or sports activity. Dr. Goonetilleke is confident that with his expertise and the internationally utilised equipment he possesses in his lab in Hong Kong he can accurately and objectively determine Muralitharan’s bowling action which has so far only being based on subjective opinions of Australian umpires. Dr. Goonetilleke who has also served as an Ergonomics consultant in the US dealing with occupational injuries and sports biomechanics for the Biomechanics Corporation of America in New York, may be just the expert Sri Lanka needs to put the Murali saga finally to rest. According to Dr. Goonetilleke, there are a number of techniques available today to measure dynamic posture using computerised equipment. One of them is an electrogoniometer which weighs no more than a few games, and which is attached across the elbow joint using adhesive or tape. Dr. Goonetilleke explains that postural measurements taken using this electronic equipment, during Muralitharan’s bowling action and performed under normal field conditions would accurately determine the three dimensional elbow angles during the bowling action. The information collected of the elbow angles at sampling rates of over 25 angles per second can be downloaded directly to a portable computer. However, in a field setting he possesses a data logger of the size of a computer mouse which can be carried around in one’s pocket in a very noninvasive manner. These data logger’s are so powerful that they can store more information than one can ever think of. 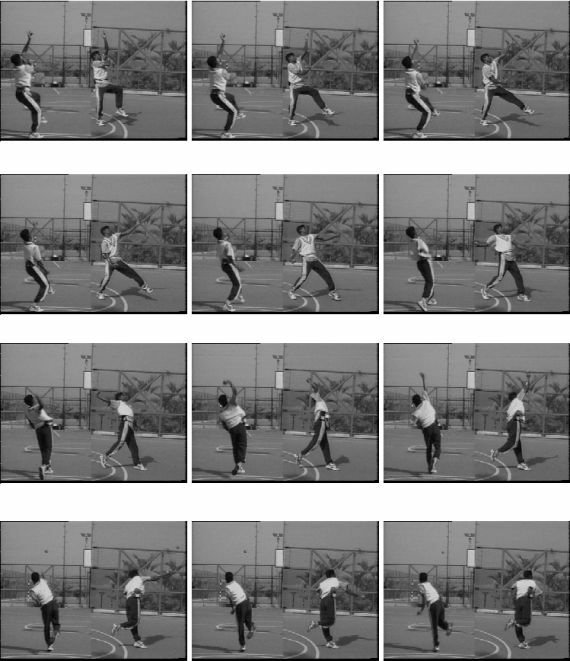 At the end of a recording session, or an actual playing session to be precise, the information in the data logger can be downloaded into a computer for further analysis to determine the elbow angles throughuot the bowling action to make an unbiased decision of the throwing controversy now existing. Read the rest of this entry ? You are currently browsing the Critiquing Cricket blog archives for January, 2011.